Wagon buyers who want a comfortable, practical and stylish vehicle with outstanding safety features should be impressed with what the new V70 package has to offer. The style of the 2008 v70 is very attractive for a station wagon and timeless. My Volvo wagon has been one of the most reliable cars I have ever owned. It is been a workhorse, traveling up and down the east coast. I love the style of this car and you do not see that many around. In all the years I have had it, the only big repairs have been replacing the air conditioner fan, a motor mount, tires and batteries. All lights breakers sits work great car. That it is a great car! Has all bells and whistles! Has 173 thousand miles and drives great! Power everything! Great air and heat works the interior is in great shape! We love it only 2 owned. It is very dependable and very attractive. And it has all the bells and whistles! I love it's third row seating, it's exterior design, and it's dependability. I also love the upgrades in it, like the heated seats/steering wheel and Bose sounds system. 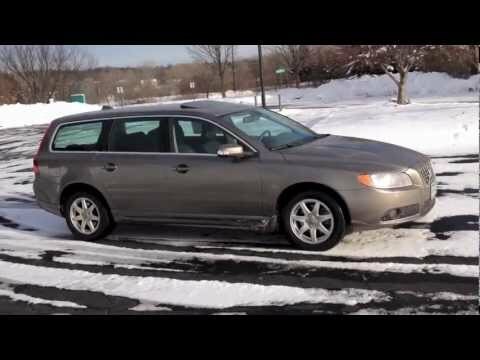 2008 Volvo V70: Exterior &amp; Interior Tour + Test Drive!